Aengus Og, or Aengus the Younger, is an Irish deity associated with love and creativity. There are said to be four birds constantly flying around his head. 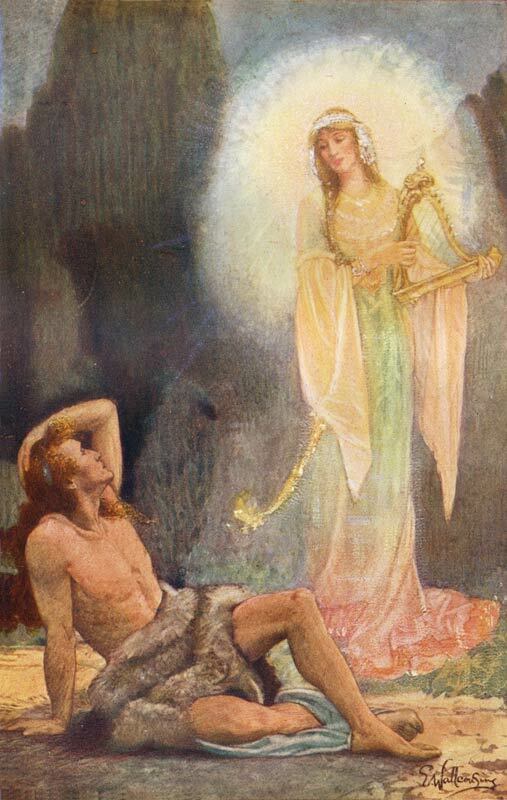 Aengus was the son of an illicit affair between the Dagda and Boann, a river goddess. In order to hide this affair, the Dagda made the sun stand still in the sky for nine months so Aengus could be conceived and born in the same day. Hey, it makes more sense than Yahweh making the sun stand still just so the Israelites would have more daylight to use for killing Canaanites. Well, maybe not more sense per se, but it’s more practical. Since the Dagda had no land left to give his children, he asked if he could stay in the Boinne River Valley for a day and a night. Since there’s no indefinite article in Irish Gaelic, he was able to stay there for EVERY day and night. That’s a joke that really doesn’t translate well. His half-brother Midir raised him, and Aengus killed Boann’s husband Elcmar as revenge for his slaying of Midir. 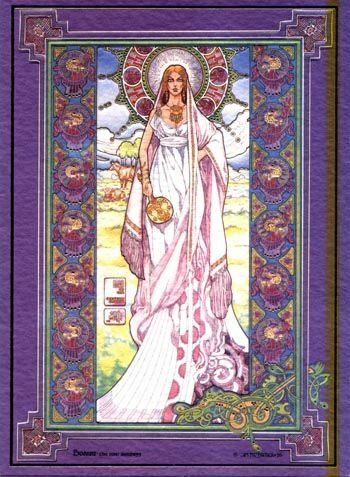 The most famous story involving Aengus, at least based on how much it shows up in the pages I’ve found on him, is of his falling in love with a woman he sees in a dream. I don’t know why he’d even assume she was real, but he had his parents search for a year to no avail. Bodb Derg of Munster, who is sometimes said to be another son of the Dagda, eventually located her at a lake known as the Dragon’s Mouth. She turned out to be a swan maiden named Caer Ibermaith, one of 150 who alternate between human and swan form, switching every year at Samhain. Aengus was told he could marry Caer if he could identify her as a swan, which he not only did, but turned into a swan himself. The two of them sang a song together that put all listeners to sleep. I don’t think the myth specifies whether Aengus also did the alternating-year shape-shifting from then on. 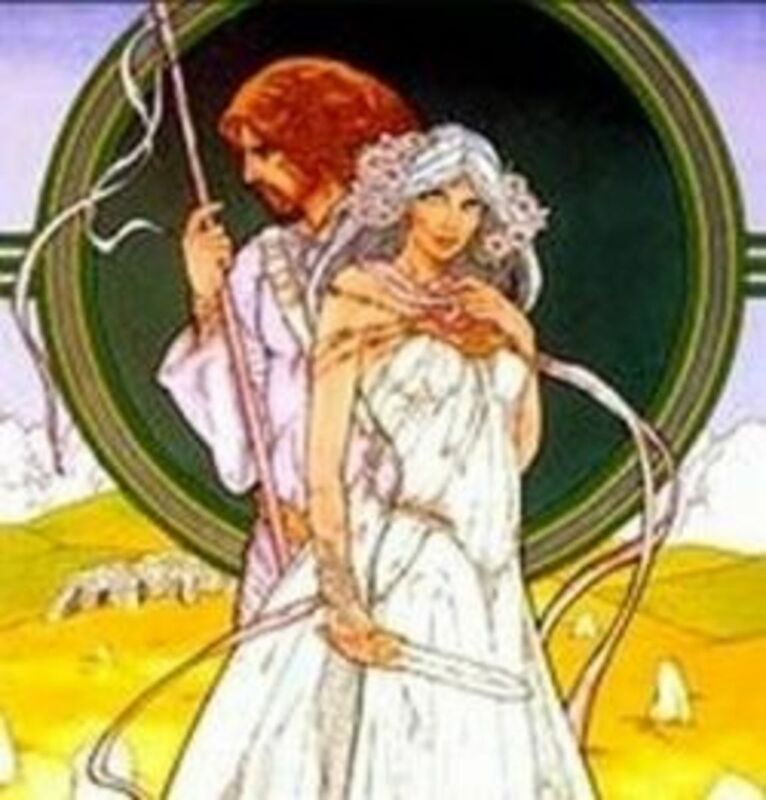 The couple were the foster parents of Diarmuid O’Duibne, a legendary warrior who was known for his love spot. When he was hunting, he carried an old woman across a river, and she rewarded him by putting a spot on his forehead that would make all women fall in love with him. This didn’t work out that well for him when Grainne, the intended wife of Fionn mac Cumhaill, came onto him. Fionn was an old man by this point, and Grainne was determined to run off with someone younger. 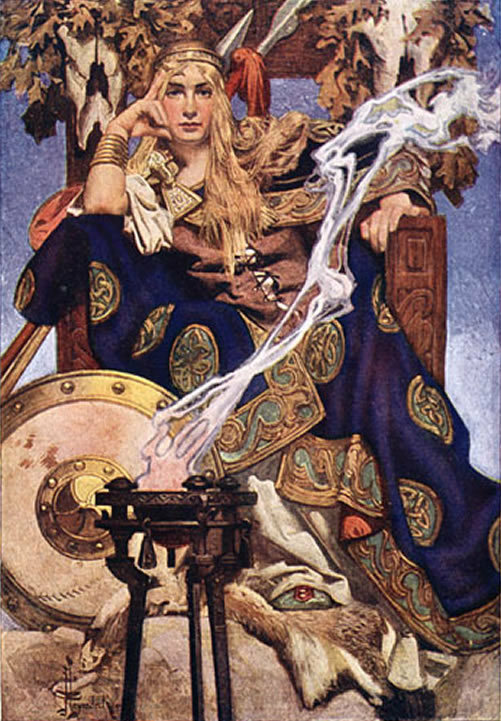 Diarmuid tried to remain loyal to Fionn, his commander, but Grainne placed a geis on him that forced him to follow her. It turned out that a lot of people were Diarmuid/Grainne shippers, and assisted the two of them on their flight from the giant warrior. Aengus eventually convinced Fionn not to kill Diarmuid, which is fair as he only hooked up with Grainne when she forced him to. Diarmuid was eventually killed by a wild boar who was actually the son of Aengus’ steward. Diarmuid’s father killed the steward’s son, and Aengus was able to bring him back to life, but in pig form for some reason. The resurrected boar was fated to kill Diarmuid due to another curse, which apparently were incredibly common in ancient Ireland. Aengus did occasionally bring his foster son back to life to talk with him. Fostering children was something Aengus seems to have done pretty often, as I’ve also seen mentions of a foster daughter who had an affair with Cuchulainn, and another who died after being converted to Christianity by St Patrick. This girl, whose name was Eithne, drank the inexhaustible milk of one of the cows Aengus brought back from India. I guess you could say they were some of the first Aengus cattle. This entry was posted in Celtic, Language, Magic, Mythology and tagged aengus og, boann, bodb derg, caer ibermaith, cuchulainn, dagda, diarmuid o'duibne, elcmar, fionn mac cumhaill, grainne, midir, samhain, st. patrick, swans. Bookmark the permalink.